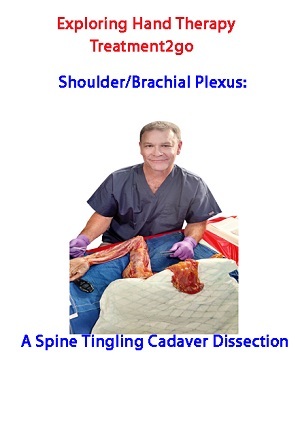 Exceptional Shoulder and Brachial Plexus cadaver course! This 2.0 contact hour AOTA approved provider cadaver shoulder dissection CEU course is phenomenal. Shannon Bogle, BHS, PT is exceptional in instructing, explaining, and demonstrating the remarkable shoulder complex. Mr. Bogle explains, in detail the shoulder complex, bony landmarks, muscles, origins, insertions, pathologies and the brachial plexus. Mr. Bogle meticulously dissects the brachial plexus including the classic "M" shape terminal branches. This course is a must have and is exceptional for an anatomical review and is most definitely clinically relevant. This intermediate level onlilne movie course has an online exam and once successfully passed (80%) you will immediately receive your certificate via email. This course has a manual and live chat during course hours. A must have course. Identify the ligaments of the Glenohumeral Joint referred to as the "Secondary Shoulder Socket"